My bus rolled south out of Quito. As usually happens in Ecuador the driver stopped at every cluster of cabanas so that vendors could climb on board, selling everything from newspapers to medicines making it a slow, but interesting trip. I bought a little bag of strips of green mango with salt to keep me going on the journey. It may sound weird but it works! 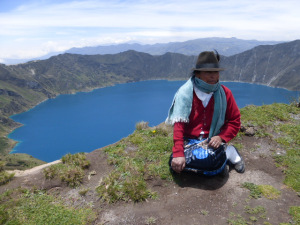 I was on my way to Latacunga from where I wanted to visit the Quilotoa volcano crater lake. South of Quito the road trundles down a wide flat U-shaped valley with the sides rising to mountains lost in the clouds. Cows grazed peacefully, boxes of beehives were in the fields and everywhere people were working the land. 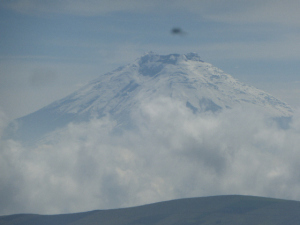 Ecuador has more than thirty volcanoes, eight of which are considered active and I was heading south on the road known as the Avenue of the Volcanoes. Latacunga is a town which sits just off the Pan American Highway and I was planning to explore the area and to do some writing away from the hustle and bustle of Quito. I trekked up from the bus terminal and plunging into the narrow streets, for once I had some luck and I found my hotel quite easily. If you are a regular reader you will know that I am always getting myself lost. 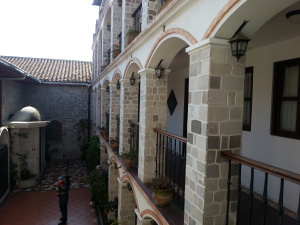 When I checked in to the Villa de Tacvnga (click here for up to date booking information), my immediate observation was one of calm and tranquility compared to the noise and chaos in the street outside. 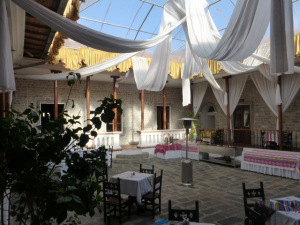 A handful of people were dining in the large central courtyard which was draped with canopies and offered a welcome shade. The rooms were built off balconies that ran around a smaller second courtyard in the Spanish Andalusian style and there were pretty tiles on the floors. I was really lucky to be given a family room – which had a double bed and a single and bunk beds; all with fleecy blue throws over them and two windows dressed with very nice gold curtains. The towels were bundled up with blue ribbons, there were chocolates on the pillows and complimentary bottles of water on the side. The whole place was extremely tastefully decorated, and as I have already mentioned, peaceful. I would also soon discover that the bathroom had a VERY powerful hot shower, there was a hairdryer and an excellent selection of channels to choose from on the television. The villa, which once occupied a much larger area than it does now, was built between the seventeenth and eighteenth centuries for the Marquis of Miraflores and now as a hotel it contains a couple of suites and many lovely rooms. I asked whether the hotel staff could recommend a tour guide as I wanted to visit Cotopaxi or preferably the crater lake of Quilotoa during my stay. At this stage in my travelling adventure I wasn’t quite brave enough to find a local bus all by myself, but the hotel staff contacted and arranged a local guide for me. 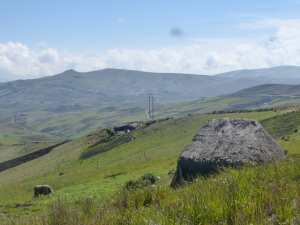 Knowing what I know now I would certainly make the bus trip myself, although at least booking with the guide I had the opportunity to meet other walkers on our trip and our minibus stopped several times along the way and the guide explained what we were looking at. I had a very filling breakfast of fruit, bread and scrambled eggs in the sunny courtyard. There was fresh raspberry juice and strong coffee and then I was met by the guide and taken to join four people who were waiting for me in a large Land Cruiser. Diego drove us up into the mountains for nearly two hours to the little town that nestles just below the rim of the crater of the Quilotoa volcano. I know that I bang on and on about the scenery in South America but it really is something spectacular and my camera just cannot capture the sheer scale of it. The roads fold around the mountainsides for miles and miles, climbing high through passes and then swooping down and round, the clouds bubble up and shroud the peaks, and here and there were large piles of dried brown grass which looked like old fashioned hay stacks. These turned out to be homes called chozas and were mostly roofs over short wooden structures but were the farmhouses of the indigenous people. The majority of the women here wore colourful skirts, long white socks, shawls and bottle green trilby hats, often with a peacock feather stuck in the side. One of them told me that the blue of the feather signifies the blue of the sky, the green hats the land and the brown for the soil. She was telling me this whilst sat on the rim of the crater and having a conversation on her mobile phone with somebody at the bottom by the lake. Leaving the car park I climbed to the top of a rise and wow, what a sight. The morning sun had turned the lake’s water a brilliant blue. Edged by the steep crater sides and with the snow covered peaks of Los Ilinizas and Cotopaxi in the distance, it was a magical sight. I slowly hiked down to the lake but I declined the option to kayak on the water and I also declined the option of riding a mule or a horse back up. I did wonder about the wisdom of that decision on more than one occasion as I struggled with the sheer climb on loose, sandy soil and the altitude (the lake is at a breath-stopping 4000 metres), but eventually, encouraged by my new friends from Spain and Bolivia who were on my tour and chatting away in my own version of Spanish, I staggered to the top. The crater measures fifteen kilometers around the rim, and from the rim to the water is four hundred meters – although the zig zag path measures one kilometer and as I have already mentioned it tops out at a breath-taking altitude of four thousand meters. The depth of the water at the edges is two hundred and fifty meters deep and in the centre – who knows!!! It’s deep. And due to the sulphur (which we could actually see bubbling at the sides) nothing can live or grow in it. After some time spent at the top, chatting to some local women we ate a very tasty lunch inside one of the hostels, warmed by a wood burner stove and sopa de zapallo (pumpkin). We had to wait for two of our party to return from their trek around the rim but I just had to keep popping back to peep at the amazing view for one more time. 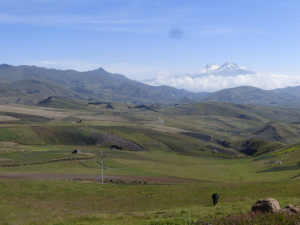 Driving back we had perfect views in the almost clear skies of the massive volcano Cotopaxi – the highest active volcano in the world, and the twin peaks of North and South Ilinizas. These were once one volcano which exploded and blew itself into two and now have their own lake high between the two. 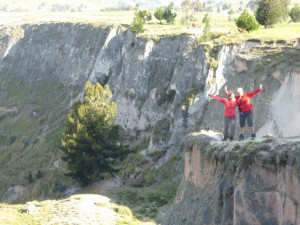 We also stopped to see the Canyon del Rio Toachi, formed in a previous volcanic eruption. The steep sides gashed through the land and a heat haze shimmered up and out despite the now brisk wind which was blowing. Back at the hotel I was welcomed once again by Nelson W. Chanatasig who was interested to know how my day had been. You can check out the rooms and the latest prices here, but what the web site doesn’t convey is the friendliness and professionalism of the staff. Sr Chanatasig and his right hand team of Juan and Belen have createe the most welcoming atmosphere in a place of sophistication. And this wasn’t just put on for me either – I watched and listened as I went through reception and they were lovely with everybody. Just before I left, the manager took me behind the scenes to the kitchen which contained the original ovens that were nearly three hundred years old and he showed me the little yard at the back which contained the well, complete with its stone water filter. This stone shaped bucket would have been filled with sand and charcoal and the well water filtered to ensure that it was clean. The hotel has been lovingly restored and there are plans to make further improvements to the building. Latacunga is a small town but one very good reason to visit is to stay at the Villa de Tacvnga in its perfect location on the Plaza of Santo Domingo, and to make the journey over to the crater lake of the Quilotoa Volcano. Many intrepid travellers also climb the Cotopaxi volcano but that, I am afraid to say, is simply way too far outside of my comfort zone! Note:- Whilst I received complimentary accommodation at the Villa de Tacvnga this did not influence my opinion or review in any way. I have portrayed an honest picture of my stay. Thank you Concha. 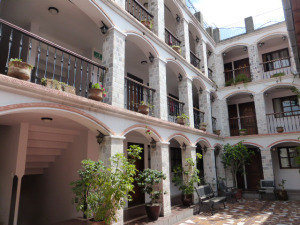 I really enjoyed Ecuador and this hotel was truly an oasis. The crater lake at the volcano was breathtaking..in more ways than one!